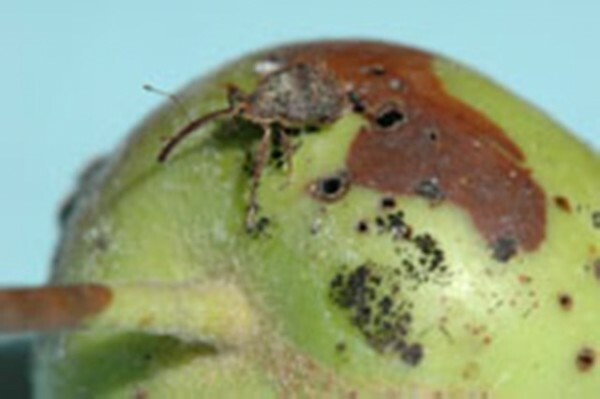 Unblemished apples require chemicals to prevent blemishes, but they are also subject to a variety of insect pests. Conventional growers kill them with a witch’s brew of pesticides, and their “perfect” apples contain residues confirming their use. The Environmental Working Group lists the most pesticide laden fruits and vegetables in its “dirty dozen” dishonor roll every year. Apples led the list four years in a row earlier this decade, falling to fourth in 2017. “What’s on my food” reports the USDA found 47 pesticide residues in apples, including six known or probable carcinogens, 16 suspected hormone disruptors, five neurotoxins, six developmental or reproductive toxins, and 11 honeybee toxins. Diphenylamine and Thiabendazole were found in over 80 percent of the samples tested. I adhere to the maxim that if you can’t pronounce it you shouldn’t eat it. Oh, and don’t forget your friendly organophosphate chlorpyrifos, which is acutely toxic and associated with neurodevelopmental harms in children. 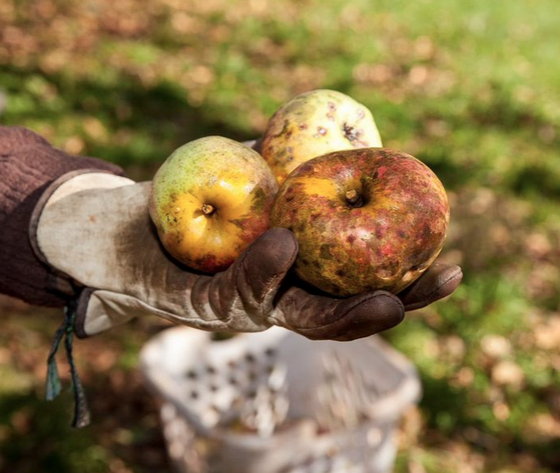 Organic apple growers can’t use them, or the fungicides that prevent blemishes. At petal fall, three insects in particular attack fruitlets: the European apple sawfly, the codling moth, and worst of all, the dread plum curculio. There is a recently developed organically approved technique for controlling (but not eliminating) all three. It consists of kaolin pottery clay finely ground to 1.4 microns and sprayed on developing fruitlets sold commercially as “Surround.” Michael Phillips, the guru of organic apple growing describes how it works in his typically colorful fashion. “Just imagine your eye and ear openings filled with irritating clay particles, and your reproductive parts literally clogged . . . surely you’d want to boogie from such a place!”. 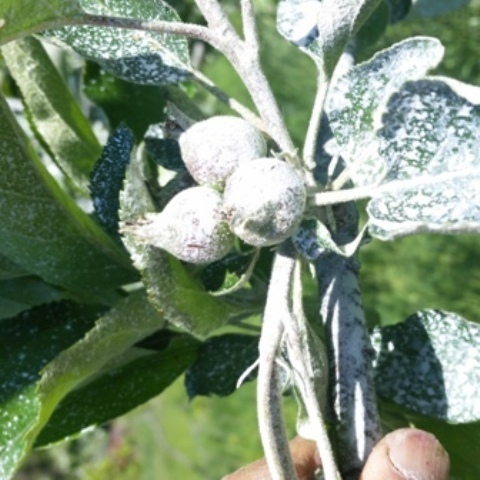 I’ve been especially compulsive about following Phillip’s spraying instructions this spring, achieving what I hope is a sufficient covering of a nice set of fruitlets on the apple trees at home and at Jade Family Farm. Here is a picture of well-coated cox orange pippen fruitlets (before rain removed much of it). Because “surround” doesn’t kill the big three pests as effectively as pesticides, some damage remains in addition to that caused by fungi that produce blemishes and many other less common insects. 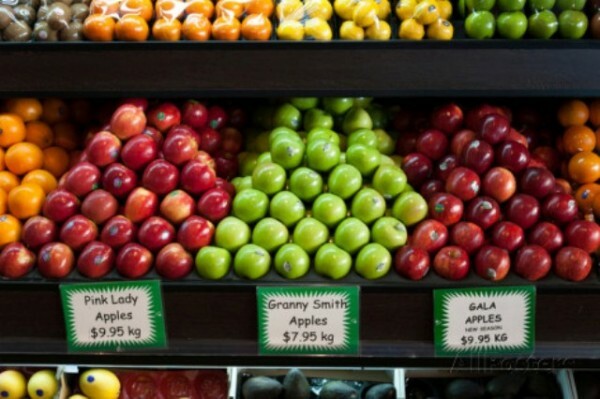 So if you want the health benefits of organic apples, and if you like to eat food that tastes wonderful, you will have to put up with less than perfect fruit. With lots of luck, I hope to bring some to the Jade Family Farm stand at the North Atherton and Boalsburg market. 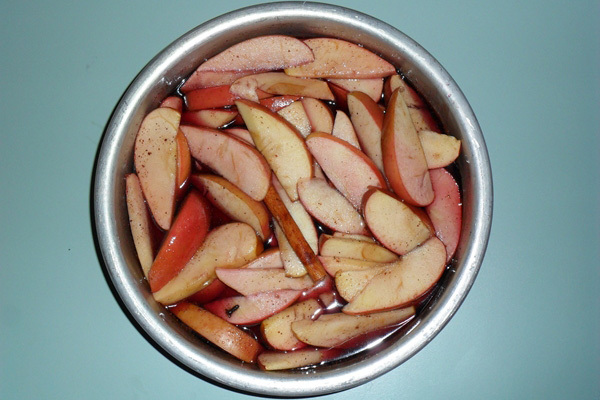 Apples like those pictured below, with a little skillful use of a knife, will pay huge dividends in flavor and health.